As a longtime avid Netflix fan, I was excited to see that they finally released an official API today. As an avid fan of the Open Web, I was even more excited to see that this API gives users full access to their ratings, reviews, and queue, and it does so using a familiar REST interface, with output available in XML, JSON, and ATOM. It even uses OAuth to grant access to protected user data, meaning you can pick up an existing OAuth library and dive in (well, almost, see below). Netflix has done a great job here, and deserves a lot of kudos! Naturally, I couldn’t wait to get my hands on the API and try it out for real. After a bit of tinkering, I’ve now got it working so it gives me my own list of ratings, reviews, and recently returned movies, including as an ATOM feed that can be embedded as-is into a feed reader or aggregator. It was pretty straightforward, but I noticed a couple of non-standard things and gotchas along the way, so I thought it would be useful to share my findings. Hopefully this will help you get started with Netflix’s API even faster than I did! Your OAuth library should parse this for you, but if you’re playing along in the test client, you’ll have to pull out the OAuth Request Token (in this case, bpn8ycnma7hzuwec5dmt8f2j) and OAuth Request Secret (DArhPYzsUCtt). 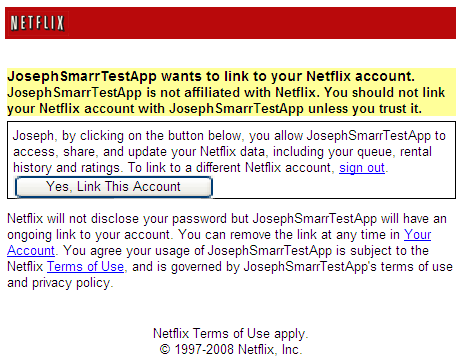 Note it also tells you the application_name you registered (in this case, JosephSmarrTestApp), which you’ll need for the next step (this is not a standard part of OAuth, and not sure why they require you to pass it along). They also give you a login_url, which is also non-standard, and doesn’t actually work, since you need to append additional parameters to it. This is not standard behavior, and it will probably cause unnecessary friction for developers, but now you know. BTW if you’re getting HTTP 400 errors on this step, try curl-ing the URL on the command line, and it will provide a descriptive error message that may not show up in your web browser. For instance, if you leave out the application name, e.g. If the user approves, they’ll be redirected back to your oauth_callback URL (if supplied), and your request token has now been authorized. Use your access token to fetch the user’s list of protected feeds. Having now successfully gone through the OAuth dance, you’re now ready to make your first protected API call! You can browse the list of available API calls at http://developer.netflix.com/docs/REST_API_Reference and in each case, the URL starts out as http://api.netflix.com/ and you append the path, substituting the user_id value you got back with your access token wherever the path calls for userID. So for instance, to get the list of protected ATOM feeds for the user, the REST URL is http://api.netflix.com/users/userID/feeds, or in this case http://api.netflix.com/users/T1G.NK54IqxGkXi3RbkKgudF3ZFkmopPt3lR.dlOLC898-/feeds. Each link contains an href attribute pointing to the actual feed URL, as well as a rel attribute describing the type of data available for that link, and a human-readable title attribute. In our case, we want the “Titles Returned Recently” feed, which is available at http://api.netflix.com/users/T1G.NK54IqxGkXi3RbkKgudF3ZFkmopPt3lR.dlOLC898-/rental_history/returned?feed_token=T1ksEAR97Ki14sIyQX2pfnGH0Llom4eaIDMwNWlUOmRZ0duD2YDbp_5PPUKBcedH51XSxPTnUOI5rCLz9feBXx9A–&oauth_consumer_key=k5mds6sfn594x4drvtw96n37&output=atom (note the XML escapes &s in URLs as XML entities, so you have to un-escape them to get the actual URL). As you can see, this feed URL looks like a normal API request, including my userID on the path, but with an extra feed_token parameter, which is different for each available user feed. This way, the ATOM feed can be fetched without having to do any OAuth signing, so you can drop it in your feed reader or aggregator of choice and it should just work. And giving access to one feed won’t let anyone access your other feeds, since they’re each protected with their own feed_token values. Of course, if you want to format the results differently, you can make a REST API call for the same data, e.g. 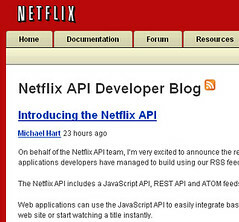 http://api.netflix.com/users/userID/rental_history/returned OAuth-sign it like you did in step 6, and you’ll get all the meta-data for each movie returned as XML, including various sizes of movie poster image. Profit! Now you’ve got a way to let your users provide access to their netflix data, which you can use in a variety of ways to enhance your site. If this is the first time you’ve used OAuth, it might have seemed a little complex, but the good news is it’s the same process for all other OAuth-protected APIs you may want to use in the future. I hope you found this helpful. If anything is confusing, or if I made any mistakes in my write-up, please leave a comment so I can make it better. Otherwise, let me know when you’ve got your Netflix integration up and running!